Leather, sat/nav, alloys, black glass pan sunroof, superb. Impressively stylish and more practical than a lot of other coupés on the road, the Volkswagen Scirocco is a great pick if you're in the market for premium, sporty car that won't fail to put a smile on your face. 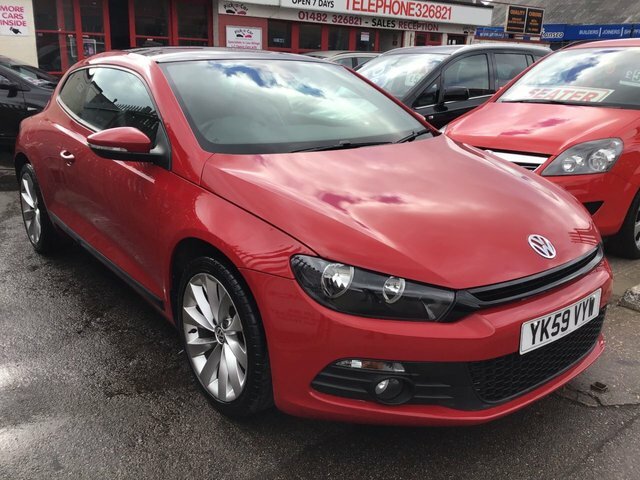 Take a closer look at the complete range of used Volkswagen Scirocco models for sale in Hull by paying a visit to our showroom today. Here at Pick A Car we're proud to offer an unrivalled level of customer service and we'll always go the extra mile to help you find the right model for your needs. Finance is available to UK residents aged 18 years or older, subject to status. Terms & Conditions apply. Indemnities may be required. Other finance offers may be available but cannot be used in conjunction with this offer. We work with a number of carefully selected credit providers who may be able to offer you finance for your purchase, commission may be received. We are only able to offer finance products from these providers. Postal Address: Pick A Car, 85 Witham, Hull, Yorkshire HU9 1AT. Find contact details here.